…because then I will not want to eat them. Now, “rice balls,” on the other hand, is so much more appealing. After all, we enjoy the idea of a food before the first bite ever reaches our mouths. Or so I’m told. 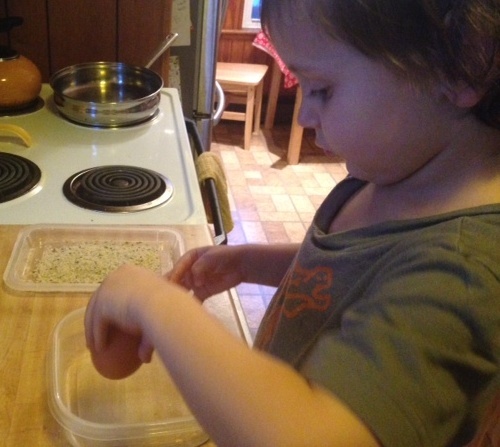 We happened to have leftover squash risotto, and Mama thought I might enjoy making the little balls with her. 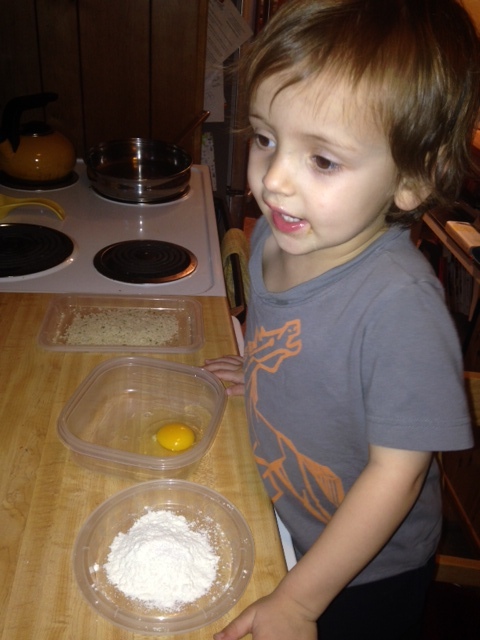 First, we set up our breading station, which includes a dish of flour, a beaten egg, and a dish of bread crumbs. I crack all the eggs in this house now. 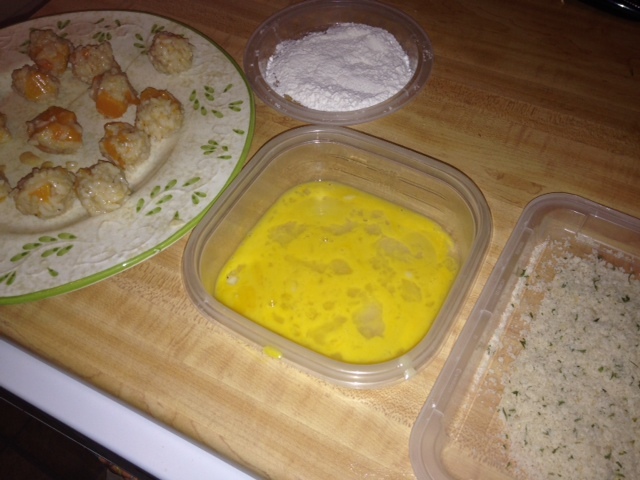 The flour helps the egg stick to the rice ball, and the egg helps the bread crumbs stay put. And I also insist on beating the egg with a fork. After this, I lost interest. I didn’t want to messy my hands in the cold risotto. 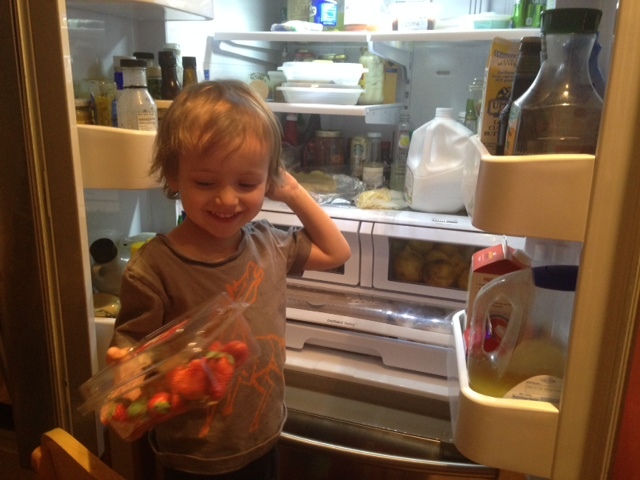 Instead of helping, I raided the fridge. Papa bought contraband strawberries out of season, much to my delight! Mama said we have to get all the balls formed before we begin the breading process, because we’re just going to get our fingers even messier once that starts. Now we’re set to start covering up those naked little rice balls with crispy bread crumbs. To bread a ball, gently roll it in the flour, then roll it in the egg (allowing excess to drip off), then roll it in the bread crumbs. Set aside. (You don’t want to start putting them in the hot oil as you make them because they’ll cook unevenly.) Once Mama set the frying pan of oil over medium heat, she shooed me from the kitchen. But I could hear those rice balls sizzling, and the house smelled good. That’s a side of balsamic-roasted asparagus and portabella mushrooms. I was eager to try one of those little guys. I really was. But to Mama’s dismay, I did not love them. I took my “no thank you” bite, said, “They are not bad,” and passed on any more. They had a nice crunch with a warm, soft center, but what can I say? I told Mama to stop calling them arancini. Make the arancini whatever size you like, from Ping-Pong to a bit larger than golf ball size. Press the mixture into your palms, and gently form a ball. 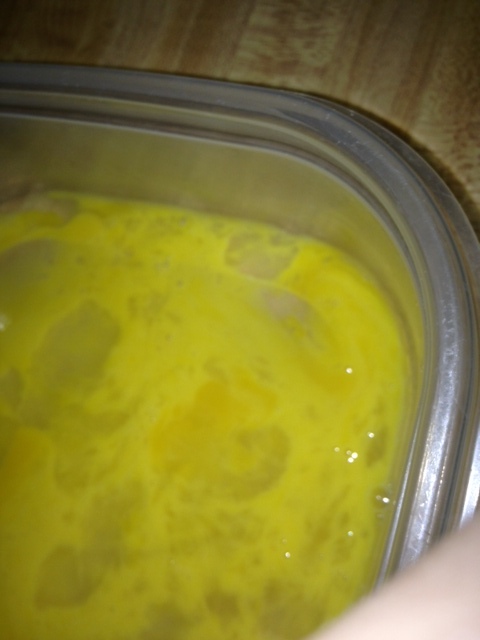 (If you’re finding that your mixture isn’t holding together well enough, lightly beat an egg and thoroughly mix it in to the rice, then try again.) Set balls aside. Prepare 3 bowls or shallow dishes for a breading station: 1 with flour, 1 with a lightly beaten egg, and 1 with bread crumbs. Season each with salt and pepper. Roll a ball completely in the flour, then the egg (allowing excess to drip off), then the bread crumbs. Set aside and repeat until all balls are crumbed. Heat enough oil to cover the bottom of a large skillet over medium heat. Toss a few flecks of flour into it—if they sizzle, it’s ready. Carefully add the arancini. Do not overcrowd. (Work in batches, if necessary.) Fry until golden, then turn until golden on all sides (just a couple minutes). If they’re getting overly dark, lower the heat slightly. Remove to a plate lined with paper towel. They’re hot, so be careful! 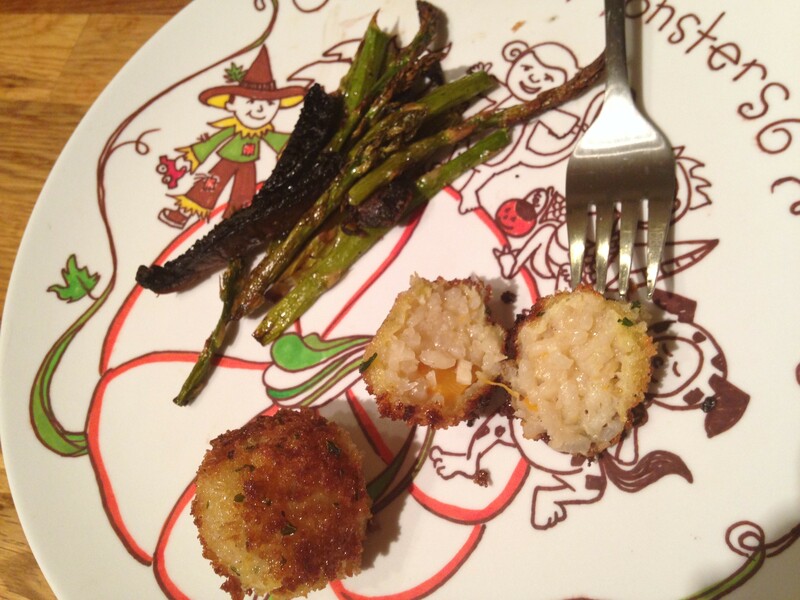 Categories: Dinner, Misses, Vegetables, With recipe | Tags: arancini, baby food, bread crumbs, breading, cooking, cooking with toddlers, deep frying, eggs, recipe, rice, rice balls, risotto, vegetarian | Permalink.